Unfortunately, a woman soon arrived and the man instead professed his undying love for her. Nonetheless, I was inspired, and had learned something important. I now realized that I could live a fulfilled and happy life devoted to a single hamburger - The Shack Burger. There are two lessons to be learned from this story. 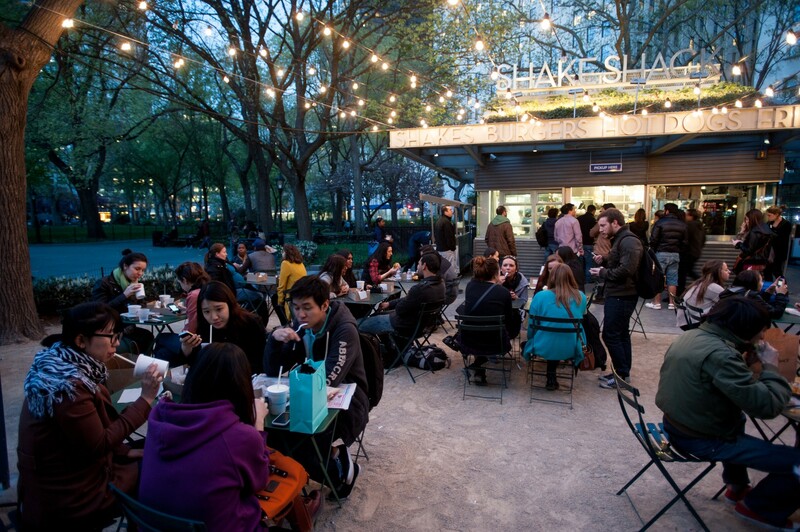 First, Shake Shack is the burger by which all other New York City burgers are to be measured. This is hamburger perfection, and the epic lines are the only thing preventing weekly Infatuation visits. Second, there is a huge badass somewhere out there that proposed to his girlfriend over a burger and fries. Well done sir. About as good as a hamburger gets. A Pat LaFrieda sirloin and brisket patty with crispy edges on a soft bun. The Shack Sauce is buttery heaven. The only downside here is that the single Shack Burger can leave you wanting more, while the double can put a hurtin’ on you. A single and a half would be about perfect. Decent crinkle fries to accompany your burger. If you are really going for it, the cheese fries are pretty damn tasty. While the burger is fantastic, the dogs at Shake Shack deserve some recognition of their own. This is a true Chicago style dog, steamed poppy seed bun and all. A Vienna beef dog topped with some high end kraut on a potato roll. Not exactly a dirty water dog, but it’s tasty.